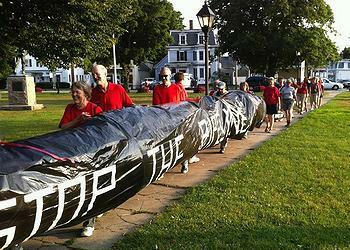 BOSTON, Massachusetts, August 3, 2014 (ENS) – The proposed extension of a natural gas pipeline that would run the length of Massachusetts is meeting stiff resistance from a broad coalition of residents, local governments, conservation and environmental organizations, and legislators. The 13,900-mile Kinder Morgan Energy Partners’ Tennessee Gas pipeline now runs from Louisiana, Texas and the Gulf of Mexico to the Northeast, New York and through much of Massachusetts, including Boston. The company wants to extend it 180 miles between Richmond in the west, on the New York-Massachusetts border, eastward to Dracut, a town north of Boston. The pipeline extension is considered a key component of a plan to meet the region’s future energy needs that was adopted at the New England Governors’ Conference last December. But town governments, conservation organizations, and private residents across the state have refused to give company surveyors permission to come onto their lands. On July 30, several hundred people protested the pipeline extension on Boston Common. An anti-pipeline relay walk along the proposed route concluded this weekend. A PVC pipe carrying a petition urging Massachusetts Governor Deval Patrick to “say No” to the pipeline was passed from town to town. Governor Patrick, a Democrat, says he has not yet taken a position on the controversy but is “skeptical” of the proposed pipeline, although he told reporters on July 30 that he supports the burning of natural gas as a transition from coal-fired power plants. The plan Kinder Morgan presented to the governors speaks only in general terms, calling for increasing the supply of natural gas, increasing the transmission of hydroelectricity from Canada, along with developing more alternative sources of energy. No specific projects were mentioned, so it attracted little attention. But Kinder Morgan had already been discussing the possibility of building a new pipeline with energy officials, and so when the Governor’s Conference gave support to increasing the supply of natural gas in the region, the company was ready to go. Within weeks the company contacted landowners asking permission to survey their land to lay out a route for the pipeline. The resistance began immediately, starting at the New York-Massachusetts state line, when representatives from Kinder Morgan asked permission to survey Massachusetts Audubon’s Pleasant Valley Wildlife Sanctuary. Permission was refused. The proposed route would run across northern Massachusetts, cutting through the last large tracts of undeveloped land in the state. It would cut through three Massachusetts Audubon sanctuaries as well as properties owned by the Trustees of Reservations, various land trusts and local conservation areas. Many of these lands are designated as critical habitats for threatened or endangered species. When it became public knowledge that the gas moving through the pipeline would be extracted from western Pennsylvania shale using hydraulic fracturing, or fracking, resistance grew louder because of the adverse environmental and health impacts of the process. Kinder Morgan has been vague about the cost of the pipeline, saying only that it might be $2 or $3 billion or “maybe more.” The company proposed imposing a tariff on Massachusetts residents and businesses to fund the project. That idea created another howl of protest, and was quickly withdrawn. “One wonders why they want to use a new right of way,” when they already have a right of way, Governor Patrick told reporters July 30. What happens next is uncertain. As long as Kinder Morgan is blocked from surveying a route, the planning and survey stage cannot be completed, a step required before the company can apply for permits from the state and from the Federal Energy Regulatory Commission.